care to share a few of yours ? This gentleman appeared to spend most of his time on the satphone. To be fair, the lighting conditions that morning on the Racetrack Playa in Death Valley National Park were dull. Image taken during last week's Fujifilm Global Photo Walk, on the east side of the US Capitol building, District of Columbia. Not all photographers work at a distance ... (Jan Anne in action, Constitution Day, 2010, Bergen, Norway). Michael Reichmann of Luminous Landscape fame tries to measure snow pack thickness on a Norwegian trip back in 2005. (he is not very tall and jumping to get higher didn't make much difference). CEO of Phase Linear USA is documenting the incident. With such a long lens at hand, no need to exert oneself too much ? 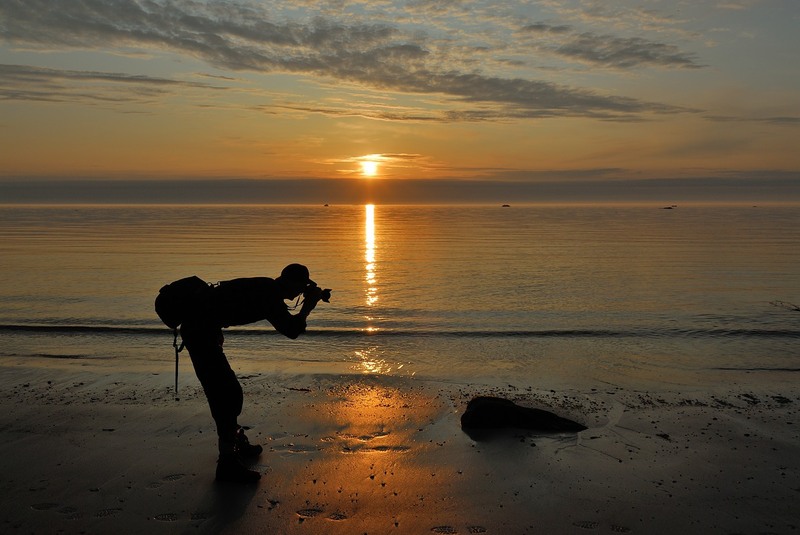 (Norwegian nature photographer Roy Mangersnes, a sworn Canon user at the time, later to become a Nikon ambassador). Not all photographers look like one! The proper way of shooting with a fisheye ? Erik the Great Dane, in a diesel engine museum .... "beam me up, Scotty"
Our esteemed Boffin, Andrea B. in action at Artist's Palette, Death Valley.